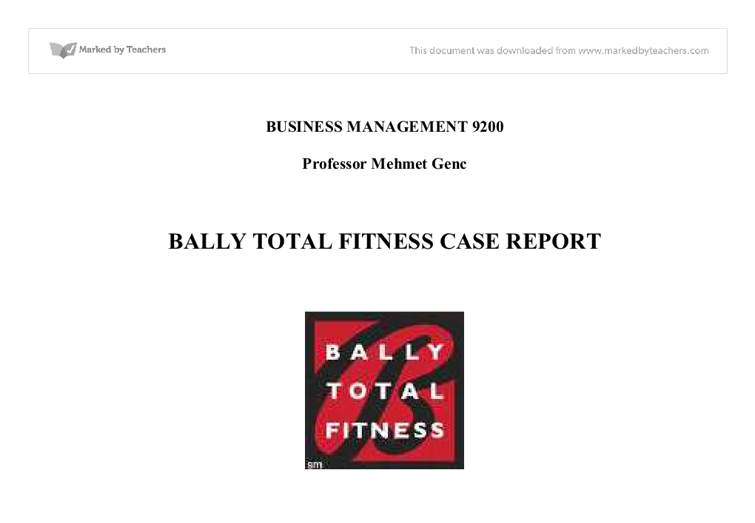 Bally Total fitness case report. BUSINESS MANAGEMENT 9200 Professor Mehmet Genc BALLY TOTAL FITNESS CASE REPORT Team Members: Ilka Nevarez Matthew Preusser Robert Schultz Diana Villacis-Velez February 17, 2009 TABLE OF CONTENTS 1. INTRODUCTION..........................................................................................1 2. CENTRAL ISSUE...........................................................................................1 3. ALTERNATIVES...........................................................................................3 3.1 Alternative I - Franchising.......................................................................3 3.2 Alternative II- Replace CEO.....................................................................4 3.3 Alternative III-Implementation of Corporate Governance.................................5 4. RECOMMENDATION..................................................................................5 5. IMPLEMENTATION PLAN.............................................................................7 6. CONCLUSION.............................................................................................8 7. APPENDICES...............................................................................................9 1. INTRODUCTION(Diana) Bally Total Fitness, an owner-operated health club chain with 360 outlets in the United States and more than 50 internationally was experiencing a difficult time in 2004. Even with revenues of $954 million reported in 2003 and with 3.6 million members worldwide their stock price had fallen from an average of $25 dollars in 1999 to $5 in 2004. Bally Total Fitness was dealing with the pressures of the Health Club Industry competition, was being investigated by the Securities and Exchange committee and major shareholders were urging CEO, Paul Toback, to sell the company. In this report, our team, Solutions Services Inc, the ("Team we") will provide our understanding of the issues faced by Bally's, identify what we believe to be the critical issues, and look to provide strategic recommendations to Bally's Management team ("Management") ...read more. Not only was there inconsistency between the prices any 2 members paid, but new members were often times required to purchase 36 month contracts up front or finance their membership by obtaining a loan from Bally's directly. Many members, however, were unhappy with a 36 month commitment and often times made requests to have these memberships cancelled. Bally's had been accused of not honoring requests and using deceptive means to collect member fees. The FTC required Bally's to pay $120,000 in penalties and refund membership fees to many of its customers. An alarming decision came in December, 2002 when former CEO Lee Hillman decided to step down suddenly "to pursue new challenges and interests and to spend more time with his family." Hillman had attempted to improve company performance, he had "sold off outlets and rationalized Bally's brand portfolio." Under Hillman, 19 clubs were divested in an effort to make the gym more profitable. Subsequently, the chain began once again to expand in the number of locations, product offerings and customer reach. Throughout its years, Bally's had diversified many of its product offerings. In addition, Bally's executed an aggressive expansion plan. 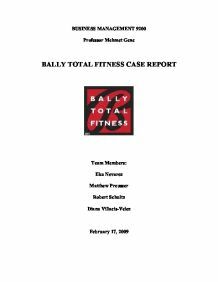 By 2003, Bally Total Fitness enjoyed 420 [D3]owner operated locations (see exhibit 4), 3.6 million 3600 members and 23,000 employees. ...read more. This cannot occur until proper corporate governance is in place. - Corporate governance is needed to bring back transparency to the books and records, accountability to management, and to restore confidence in the capital markets, - This is evidenced by the aggressive expansion undertool, which resulted in excessive debt, and the eroding of the companies balance sheet. Actions clearly not in the best interest of shareholders. Excessive debt... poor oversight..... and inadequate risk management systems. The rationale for Corporate Governance is : Adherence to good corporate governance plays a key role in sustaining the overall health of the company, and ensuring it's ability to withstand crises, and manage risks. 5. IMPLEMENTATION PLAN(Diana) > Director Training - Board members to undergo mandatory seminar/training on Corporate Governance to familiarize themselves with their duties and responsibilities and corporate decision makers. > Ongoing Training At firm for all employees- ethics, good decision making, etc... > Shareholders should be given vote to elect board members > Shareholders given vote to replace / remove CEO 6. CONCLUSION 7. APPENDICES [D1]Could we do without this sentence. I am a bit confused by it. [D2]I think you meant to include this. [D3]That's weird for 2003 they quote two different number of gyms (410 in pg 6) ?? ?? ?? ?? ...read more. For those that are doing well, they could place another order, which would then be despatched within then next two working days. Depending on the line, the stock can be held from 1-3 weeks, obviously something's are going to go much quicker than others, for example women's clothing, whereas, home ware maybe in the warehouse for longer. activities and its investments in the above initiatives because unlike a lot of other companies who get into CSR without doing their homework and as a result get accused of doing it for ulterior motives, Infosys' engagement with the field of technical education is a natural extension of its business practices. They are not happy with the 'given' quality. * Emergence and awareness of health and treatment of new diseases requires health services to adapt to these changes. Technological * The improvements in technology have laid pressure on the administration of public services. Also the use of management information systems has an influence on public services. it before this will ensure that Ginsters is capturing customers and potential customer, and ensuring that they are doing everything to ensure that people watch their advertisements. This PEST factor could also affect Ginsters because Ginsters often have special edition products that they bring out for a limited period of time such. Marketing Objectives In order to achieve my business objectives I must be able to market both the business and its products effectively. In order to remain focused on how best to market products businesses set marketing objectives, which similarly to business objectives, they will aim to achieve in a certain amount of time. In 2002, more than half of the Chick-fil-A operators were making over $100,000 a year, with some making as much as $300,000. Chick-fil-A also offers licensing agreements to open a Chick-fil-A Express in places such as college campuses, hospitals and airports.